We just celebrated Pi Day yesterday. These are super easy and quick. In a sauce pan, add cherries, sugar, lemon juice and salt. Simmer for 5 minutes or until they start releasing their juices. Stir in cornstarch mixture and bring to a boil stirring often. Once it starts to thicken, remove from the heat and add the vanilla. Let this sit and cool. Stir ingredients together. Set aside. Preheat oven to 375°F. Lay the puff pastry squares out on two baking sheets covered with a silpat each. Poke four times each square with a fork to prevent the middle of each danish from rising. Now you can get creative. Cream cheese topping will cover around 11 danishes. You can choose how to flavor them. I used cream cheese and banana (tasted just like a banana cream pie) sprinkle with a little brown sugar. I made pear danishes with cream cheese and pears also sprinkled with a little brown sugar. 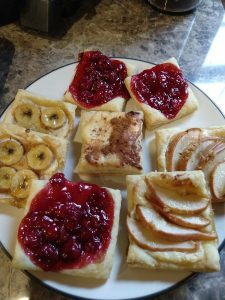 The cherry danishes were made with just the cherry mixture on the top. Bake in preheated oven for 20 minutes or until puff pastry to turned golden. I would like to try apple danishes for sure. Also, any berry would probably work as well. Tonight we tried a new recipe. 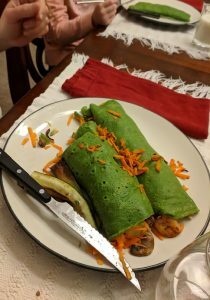 I made spinach crepes for dinner and stuffed them full of savory ingredients. The kids loved them. My son asked me to save this recipe so we can have it for dinner again. Puree the spinach and milk together until liquid in a blender. Add in the flour, eggs, sugar and salt. Add a little oil to a crepe pan and start making. I use 1/4 cup per crepe. This recipe will make 12 – 14 crepes. We filled the crepes with different vegetables. I also made shrimp and had leftover venison burgers that I put into the kids. We had the leftover crepes for dessert as well. Unfortunately, I did not get a picture of these. They were awesome. My dessert hound (daughter) loved them. I put 2 teaspoons of nutella in each and folder them in a quarter. I put a small scoop of New Zealand Ice Cream on top and a little chocolate syrup. I also sprinkled a couple of pecans over. They were wonderful. This recipe is what I use when I want to make Chicken Noodle Soup. These are delicious and the kids love them! In a Kitchenaid mixer, add flour, eggs and salt. Slowly add water until dough comes together. Don’t add too much water as this will make the dough very sticky. Turn out onto a floured board and cover with plastic wrap. Let sit for 20 minutes before you start rolling them out a cutting. You can use a pasta cutter attachment if you have one. I usually roll out by hand and cut them with a dough cutter. They look really homemade that way. Boil in the soup just before serving. You can also boil in a pot of salted water and transfer to the soup as well. This is perfect for a cold, winter day. Pair with some everyday bread and enjoy! Preheat the oven to 350 degrees F. Grease a 9inch spring cake pan and set aside. Peel, core, and thinly slice the apples. Beat the eggs, sugar, lemon zest, vanilla and salt until thick and creamy. Add the flour, baking powder, and milk, and beat until well combined. Add in the cinnamon, cardamom and ginger. Stir together. Add two thirds of the apples to the batter and mix. Pour the batter into the spring pan. Arrange the apple slices over the batter ad sprinkle with a little brown sugar (about 1 tbsp). Bake for 35 minutes or until set. Dust with powdered sugar before serving and enjoy. I needed to use up some buttermilk and found this recipe. These are wonderful with dinner. Heat the oven to 450°F. Mix all dry ingredients together. Add in 7 tbsp butter in small bits. Reserve 1 tbsp on the stick of butter to brush onto the tops of the biscuits once baked. Carefully break up the butter with your hands or a pastry cutter into the flour. Add in the buttermilk and mix until dough comes together. If the dough is too dry, add in a little more buttermilk (teaspoons at a time). Turn out dough onto a silpat and knead about three times. Form into about 16 – 20 biscuits using a biscuit cutter. Place biscuits onto a silpat lined baking sheet and bake for 20 minutes. When finished baking, brush with reserved tablespoon of butter and serve. In a sauce pan, add all ingredients together minus the chicken. Bring to a simmer, set aside until the coals are ready. Skewer the chicken and brush with sauce while grilling. orget about them, I want them on my blog so I can find them again. Poke and wrap sweet potatoes in plastic wrap. Microwave for 10 minutes. Let sit until cool enough to handle. Grate the 2 inch piece of ginger into a cheese cloth in a bowl. Squeeze ginger until juice comes out and discard of the solids. Cut the sweet potatoes in half and scrape out the insides. Combine with the ginger juice, half & half, butter, 1/2 tsp salt and nutmeg. Mix together well until whipped look. Add mixture back into potatoes. Heat an oven to 400°F. Put stuffed potatoes into the oven to warm up while you make the meringue. Whip 2 egg whites, cream of tarter and 1/8 tsp salt until foamy. Slowly add powdered sugar, 1 tbsp at a time until stiff peaks form, about 2 minutes. Remove sweet potatoes from the oven and spoon on the meringue evenly over the potatoes. Bake again for 7 minutes until golden brown. Serve immediately. Paul made dinner recently and had this salad as a starter. It was delicious. I will definitely be making this again. Soak the celery and green onions in ice water for 20 minutes. Drain on paper towels then transfer to a large bowl. Halve and core the apples and cut into 1/4 inch wedges. Chop a red pepper and toss with the apples, celery and green onions. Pour the lemon juice over salad and season with salt and pepper. Taste and adjust seasoning with more salt, pepper, and lemon juice, if needed. Add half of the peanuts, half of the parsley, and olive oil; toss to combine. Top with remaining peanuts and parsley. Chill until cold before serving, about 15 minutes. Mix everything together. Prep a baking sheet with a silpat and create about 20 balls. Bake at 350°F for 20 minutes. Serve with lemon.